If you have elementary-aged kids and you live in Toronto, then today is your third last day of school. Some of you have purchased a gift for your child's teacher. Some of you still plan on purchasing a gift for your child's teacher. Some of you still plan on purchasing a gift for your child's teacher but have no idea what to get. Some of you have no intention of purchasing a gift for your child's teacher. And then there's the rest of you who still aren't sure if you should purchase a gift for your child's teacher. 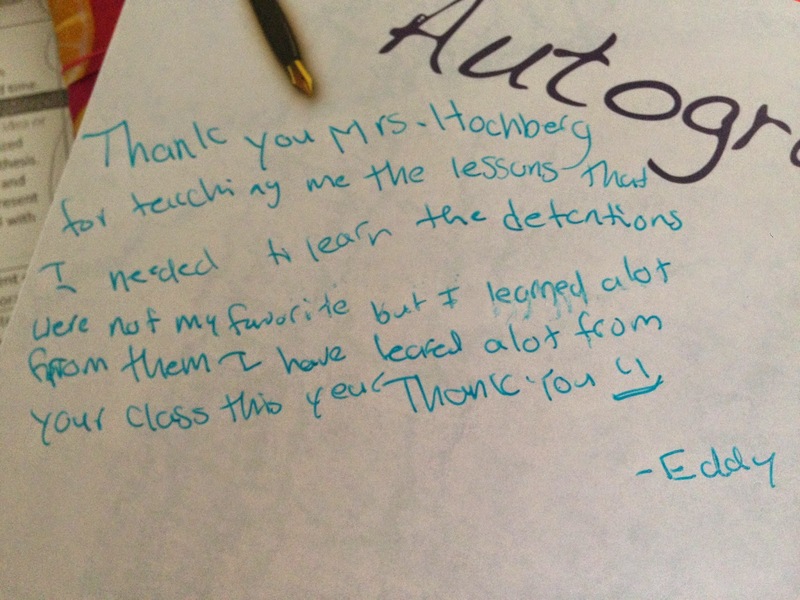 If you think your kid's teacher did a good job this year, write them a nice note telling them so. And if you happen to attach that note to a box of chocolates, coffee card, or a great book, so be it. And that's it. For real! But really, it's just that note that counts. That note that let's me know that you think I did a half-decent job helping your child learn a few things about a few things. For real. That's all we really want. At the end of the year when us teachers share get together and talk about what we "got" from our students, almost no one brags about the gifts they got. What we brag about is our favorite notes. The one from the kid who you really didn't think liked you at all. Or the giant card from the class that drove you the most crazy. Those are the end of the year gifts that validate that the one thing I've been working towards all year has come true: that I made a difference. That even in the smallest way, I had a positive impact on your child. (b) a note from my supply teacher telling me where she put my gifts. (a) The supply teacher put the gifts away somewhere and I just haven't found them. This is a problem because I always write personalized thank you notes and would feel really bad if someone had given me a gift that I didn't acknowledge. (b) All my gifts were somehow stolen/thrown out, resulting in the same problem in scenario (a). (c) All the parents & kids are upset that I was away the last three days before break and thus, decided not to give me anything. This makes me feel terrible because I hate when people are upset with me. (d) All of the parents & kids really don't like me at all and never had any intention of giving me anything. This makes me feel super-terrible because I really do love my job and really do try my hardest all the time to make my program better and make my kids even more successful. Why did I tell you that story? Because it illustrates precisely why I need your end-of-the-year teacher's note (notice I didn't say gift). I need to know that you think I did a decent job. I need to know that you are aware that I was in school almost an hour early every single day just in case your daughter needed extra help. I need to know that you appreciate that at the beginning of the year, your son didn't know that he was supposed to capitalize the pronoun "I" and today he just got the most improved award from me because he wrote a poem that brought tears to my eyes. That I keep a box of granola bars in my desk for those moments when your "too cool for breakfast" tweenager humbly admits that he's hungry. That over the past 10 months, I have truly come to care about your child and tried to teach, comfort, nurture, and encourage her as if she were my own. 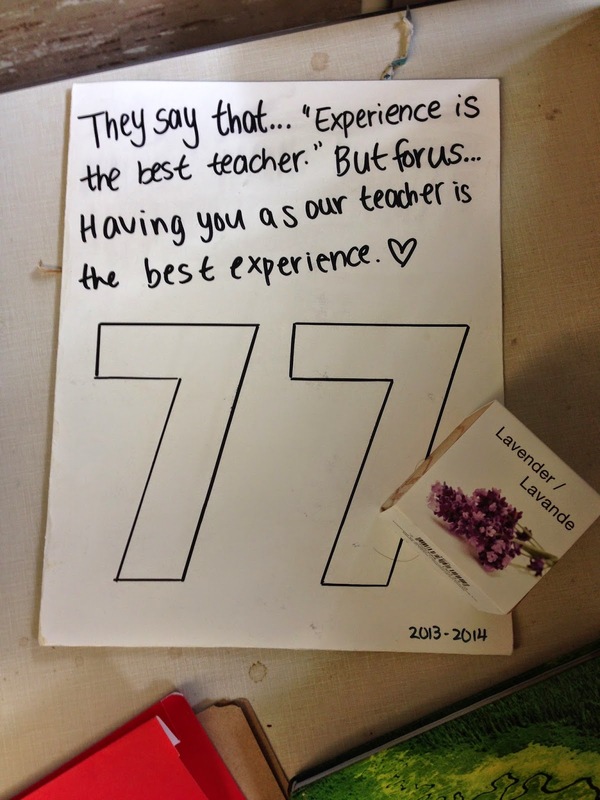 I need to know that you know that for me, teaching isn't just my job, but my passion. So whether you've splurged for an expensive bottle of wine or went in on a class gift or even brought in a homemade macaroni necklace (from the kid, not you), please know that more than anything, the accompanying "Thank You" card means the world to me. And for all the teachers out there, I am letting you know that without a doubt, it really was my sincerest pleasure.